I like my coffee in the morning with a little equal. There. I’ve come out and said it. I know that that’s somewhat hypocritical since I value eating mostly natural foods. Is it really that bad for you? There’s a lot of confusion out there about artificial sweetners. And the truth: well it isn’t quite clear! There are three leading types of sweeteners on the market right now. The pink ones, Sweet’N Low, are made from saccharin, and are 300 times sweeter than sugar. The blue ones, Equal, are made from aspartame and are 180 times sweeter than sugar. 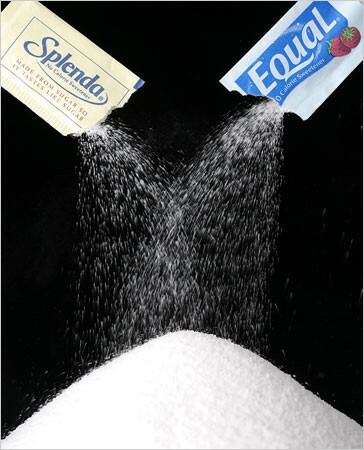 And finally, the new kid on the block, Splenda (yellow), is made from sucralose, and is 600 times sweeter than sugar. While there were some scary studies done in the 70s linking saccharin to cancer in rats, there’s little evidence that it has the same effect in humans. The only conclusive study on sweeteners was done in 2001 and found that aspartame can cause headaches (so beware my migraine-prone readers!). The FDA established some safety guidelines: the average adult can consume 8.5 packets of Sweet’N low, 87 packets of equal, or 25 packets of splenda daily. So sweeteners won’t do you any REAL harm, and it’s much better than consuming hundreds of calories in sugary drinks. HOWEVER, it’s not so cut and dry. A 2004 Study in the International Journal of Obesity suggests that consuming sweet diet drinks without any calories , we crave sugar even more. Lona Sandon, R.D. at the Univesity of Texas Southwestern Medical Center states, “Substitutes may not signal the same satiety hormones as sugar, making it easier to overeat.” Furthermore, saving 100 calories on a drink may make you more likely to eat a cookie (hey you saved them right?). So what’s the bottom line on all this. It’s OK to use a couple packets of sweetener in your morning coffee or tea. I would suggest limiting your daily intake to 2-5 packets. Try using vanilla or chocolate soymilk in your coffee if you like a smoother flavor. And rather than eating fakely sweetened drinks — try to drink water with lemon, tea or flavored seltzers instead. If you craving something sweet, try eating a little of the REAL thing. A couple squares of dark chocolate will make you feel a lot more satisfied than the sugar free stuff…and contain healthy antioxidants. Now that’s a sweet treat we can all feel good about!